This distinctive desktop clock makes a handsome addition to your professional office. The hexagonal shape lacquered wood box features a lustrous piano finish. 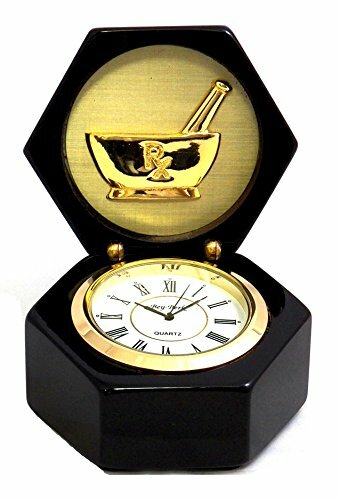 Lift the lid to reveal the Pharmacist logo tucked under the lid and a handsome clock accented by a lustrous brass plated bezel. Comes complete with a brass plated faceplate for personalization that you can have engraved at your local jewelers. The brass plated faceplate is a separate item which attaches with an adhesive backed tape and can be applied to the top of the box or one of the sides - or does not have to be used at all. Measures: 3.25'W x 3.25"D x 4"H. Quartz movement. Takes one SR626 battery. Quartz movement. Takes one SR626 battery. If you have any questions about this product by KensingtonRow Home Collection, contact us by completing and submitting the form below. If you are looking for a specif part number, please include it with your message.